... we said that "this will be a disaster for Q4 GDP forecasts which we now expect to print in the low 1% range." And sure enough, the downgrades started shortly thereafter, with virtually every bank slashing its estimates for Q4 GDP. JPMorgan was first and now forecasts that Q4 GDP grew at just 2.0% annualized, down sharply from the bank's prior estimate of 2.6%. Barclays joined the bandwagon, cutting its previous 2.8% Q4 GDP forecast to 2.1%. 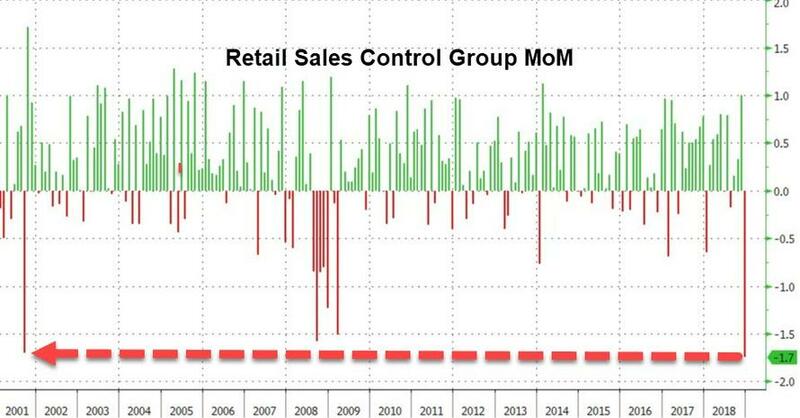 Goldman wasn't far behind, and in a note released by its economics team, said that "the retail sales report indicated a considerably weaker pace of fourth-quarter consumption growth than we had previously assumed. Reflecting this and lower-than-expected November business inventories, we lowered our Q4 GDP tracking estimate by five tenths to +2.0% (qoq ar)." Goldman also lowered its subjective odds of a Q2 Fed hike to 15% (from 25% previously), which is of course, amusing considering that as recently as 2 months ago Goldman was expecting 4 rate hikes in 2019. After this morning's retail sales and retail inventories releases from the U.S. Census Bureau, the nowcast of fourth-quarter real personal consumption expenditures growth fell from 3.7 percent to 2.6 percent, and the nowcast of the contribution of inventory investment to fourth-quarter real GDP growth fell from -0.27 percentage points to -0.55 percentage points.